There’s nothing better than a recipe handed-down through generations that stands the “test of time”. We grew and harvested apples at my nearby childhood home. My parents accepted donations for the hand-picked, polished and proudly prepared produce they carefully cultivated nearly half the year. They were acknowledged for their earnings as pioneer supporters of ‘Heifer Project International’, helping others to feed themselves via sustainable farming. 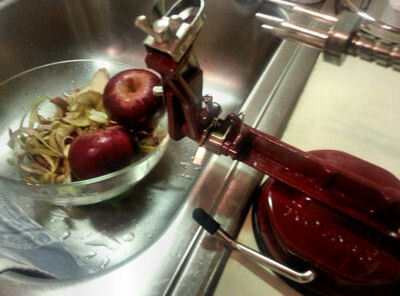 Old-fashioned apple corer and peeler. In the tradition that was uniquely my Mother’s, I share this classic process with you, slightly expedited but with all the goodness of simple down-home cooking. Pour 1 C. filtered water into a Crock Pot on low setting for all day or slow, overnight cooking, or on high for a couple of hours. 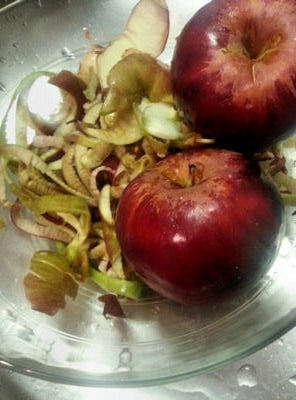 Peel and core 12-15 quercetin rich apples of different varieties. 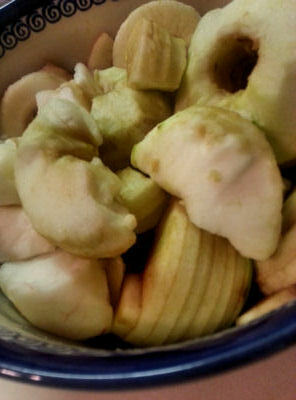 I chose a combination of local McIntosh, Jonathan, Cortland and Granny Smith, the same we grew on the homestead. This blend of firm textures, crisp flavors and a balance of sweet and tart complement the slow-cooked concoction, satisfying diabetic requirements. with star anise, high-grade cinnamon for depth, dried orange peel for brightness and a generous grating of fresh nutmeg. Top it off with about a Tbsp. of raw organic sugar cane or agave syrup to sweeten. 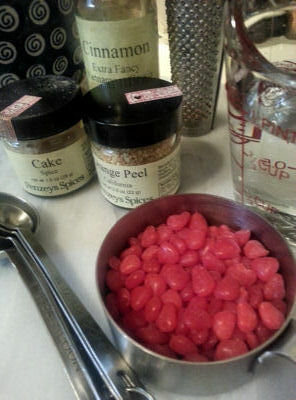 I ceremoniously add ½ C. of cinnamon red hot candies to the first batch of the season, in memory of my Mother. Place all ingredients in order listed into slow-cooker. 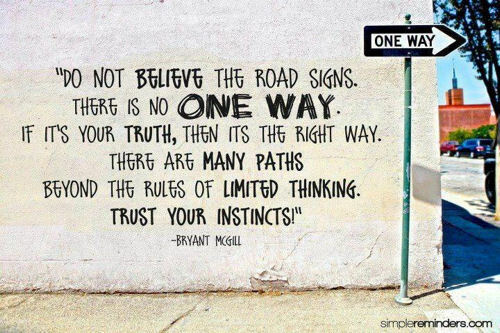 Use your best judgment should you opt to use sweeteners and organic and/or locally grown produce. In the 1980’s, I was reprimanded by the self-proclaimed “food police” for providing preschoolers unhealthy snacks containing sugar and poisonous apple skins. The very suburb criticized in today’s newspaper as a top city to avoid by French tourism (the capital of haute and nouvelle cuisine). Currently, they are well known for their innovative restaurants but it is often the misinformation that can be most dangerous. Today we have more information about what constitutes “healthy” food v. foods to avoid, and why. HFCS (high fructose corn syrup) was not as prevalent an ingredient over a quarter a century ago. GMOs were virtually unheard of while little differentiation was made between “organic”, “natural” and “locally grown” produce, and not as widely available. 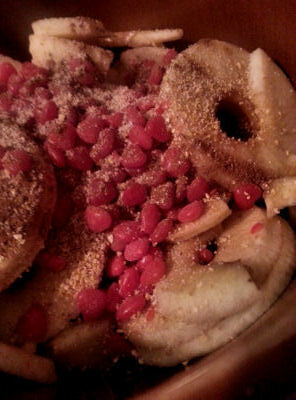 Soft and warm applesauce cooked to your liking.